We provide this information on buffel grass pastures in the Kimberley to be used as a reference for assessing pasture condition, and as a guide for pastoral station staff and others interested in the productivity and maintenance of the pastoral rangelands. These pastures are part of the Kimberley red soil group – not spinifex pastures, and the perennials buffel grass and birdwood grass are the identifier grasses. Buffel and birdwood grasses (Cenchrus ciliaris and C. setiger) are introduced species established across much of the pastoral areas of Western Australia. Use the interactive key to pasture condition to help identify pasture type. Buffel grass pastures can support higher stocking rates than the endemic native plant species. Buffel grass pastures in good or fair condition are stable and resilient under grazing. They are reasonably drought tolerant and may colonise previously degraded areas. This is the most productive pasture type in the Kimberley because it can provide very good quality feed for 6 months of the year. Buffel grass pastures are highly productive and buffel grass is preferentially grazed when green and actively growing. These actively growing plants have higher protein, phosphorus and digestibility than native grasses. Buffel grass responds quickly to rain and can supply large quantities of good quality feed. Buffel grass is highly palatable when green, although there is variation from moderately low to high between sites and perceptions by managers (Bohning & Wilkie 1999). As buffel grass hays off, the protein content, digestibility and palatability rapidly drop, providing a sub-maintenance ration for livestock. Palatability when dry can range from low to high, depending on the site and perception of managers (Bohning & Wilkie 1999). Most managers report moderate palatability when dry. Where other palatable perennials are present, grazers move to those species as the buffel grass hays off, allowing buffel grass to produce abundant seed. This grazing pattern favours the survival of buffel and birdwood grasses over other palatable pasture plants, resulting in buffel grass stands becoming stronger and other grasses being crowded out. Pasture diversity is lost through competition with native species. Buffel grass can displace desirable native grasses that are highly valued fodder. This means the grazing value of the pasture in dry spells is decreased. Buffel grass can quickly become rank and less palatable if ungrazed for too long. Areas of useful pasture can be maintained by grazing heavily and then spelling to allow regrowth. Buffel Grass Pastures may be burnt at the beginning of the dry season to remove rank growth and to provide nutritious green pick. These pastures should not be burnt every year because this will reduce plant vigour. The grazing value of buffel grass–dominated pasture may run down over time because the less-palatable forms gradually become dominant through selective grazing, and there is likely to be a long-term reduction of soil nitrogen. Buffel grass contains oxalates and can cause oxalate poisoning in young and hungry sheep, and calcium deficiency can cause ‘big head’ in horses. Calcium deficiency can be reduced or prevented by providing a mixture of other grasses and feeds or calcium and phosphorus supplements. These conditions are not usually a problem in mature ruminants or with the mixed pasture types commonly found in the WA rangelands. Buffel grass has diverse forms and cultivars with ongoing hybridisation, with new forms developing in the wild. Birdwood grass is similar and occurs less commonly. This diversity of types means that buffel grass can adapt to a wide range of growing conditions. Some cultivars are more palatable than others. The less-palatable forms may gradually become dominant in grazing lands through selective grazing, progressively reducing long-term productivity. Buffel grass can form a relatively continuous flammable ground layer that can carry more-intensive fires than that experienced in native plant communities. More-intense fires can lead to loss of established trees and shrubs, young plants before they have produced seed, and fire-sensitive species. Loss of fire-sensitive species is an issue around native vegetation associated with springs and monsoon vine thickets. Fire risk increases where there is weedy invasion of environmentally sensitive areas, especially when stock are excluded. Buffel grass has strong weed characteristics and has invaded environmentally sensitive areas, such as freshwater springs. Native plants have been affected by competition, altered soil nutrients and water availability, constraints to recruitment (such as shading), altered fire regimes, changes in availability of dispersal or pollination agents, allelopathy and increased grazing pressure (Friedel et al. 2006, p. 9). Buffel grass and birdwood grass have become naturalised in many parts of the Kimberley. Buffel grass pastures include buffel and birdwood dominated sub-types. These pastures particularly thrive in well-watered areas, such as creek lines, sandy alluvial plains and river levee banks where they are an important component of the Gogo, Ivanhoe, and Coonangoody land systems. Buffel grass was introduced to north-western Australia and central Australia, and probably elsewhere, in the 1870s by Afghan cameleers. Much later, it was deliberately introduced to improve pasture production on degraded rangelands. It is native to northern Africa, the Middle East and across to India, and Indonesia (Friedel et al. 2006, p. 4). Buffel grass is suited to areas with an annual rainfall of 300–750 millimetres (mm) and will grow in areas up to 1200mm. Buffel and birdwood grasses quickly respond to even small amounts of rain. 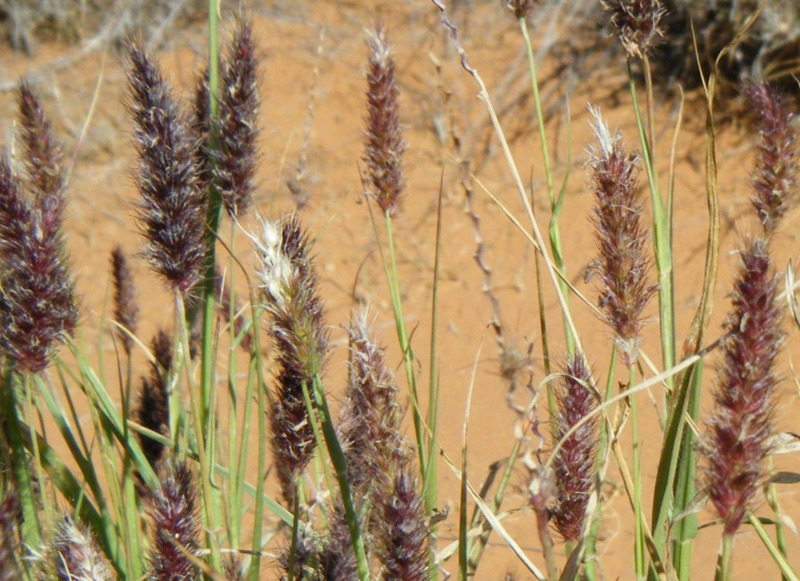 Buffel grass can do well on a range of soils, although it prefers lighter, alkaline or neutral-acidity soils with moderate to high nutrient levels, and does not tolerate flooding or waterlogging. Extended waterlogging or flooding can kill buffel grass, leaving very little forage. Buffel and birdwood grasses have colonised many previously degraded areas along the river banks of the Kimberley, especially around Fitzroy Crossing and the Nelson Land System near Halls Creek. These pastures also thrive along the coastal plain margins and landward margins of the coastal dunes in the West Kimberley: soils in these areas are usually red earthy sands, calcareous loams, or calcareous sands on the low dunes. Structure and composition are variable and a function of soil fertility, soil type, microtopography and prevailing climatic conditions. Buffel grass pastures may be open tussock grasslands with isolated trees, or along river banks may be grassy woodlands (projected foliar cover 10–20%). In each case, the ground storey is dominated by buffel or birdwood grass. Along the river banks the most common trees are bauhinia (Bauhinia cunninghamii), coolabah (Eucalyptus coolabah), river red gum (E. camaldulensis) and whitewood (Atalaya hemiglauca). While buffel or birdwood grass may dominate the grass layer, other grasses include ribbon grass (Chrysopogon fallax), bundle-bundle (Dichanthium fecundum), black speargrass (Heteropogon contortus), limestone grass (Enneapogon polyphyllus) and silky browntop (Eulalia aurea). Birdwood grass tends to dominate on the heavier alluvial soils, while buffel grass dominates on the coastal sands. On the margins and on the Anna land system on the coastal plain they often co-dominate, with birdwood grass increasing over time. On coastal dunes and plains, the shrubs include dune wattle (Acacia bivenosa), kapok bush (Aerva javanica), and green bird flower (Crotalaria cunninghamii). Other grasses include soft spinifex (Triodia pungens) and boat panic (Whiteochloa airoides). where buffel grass is replacing desirable perennial species that are more drought-tolerant than buffel grass, condition is regarded as declining. We rate only established buffel grass butts (evidence of a long-lived perennial) for rating condition. Buffel grass can also function as an annual: quick to germinate from seed, quick to grow and set seed for replenishment, and then die off within a season. If buffel grass acts like an annual, it is considered in the same way as other annuals when making condition ratings: it is disregarded. Good: Buffel grass pastures in good pasture condition are dominated by buffel or birdwood grass. Other grasses include ribbon grass and bundle-bundle. There is little bare ground visible and there is an even cover of vigorous plants. Figure 1 Buffel grass pasture in good condition in the Kimberley (photograph taken September 2008). A Buffel grass dominates; plants are vigorous with relatively uniform spacing between them; the soil surface has been disturbed by trampling but there is plenty of litter and minimal bare ground; there are no signs of erosion. Fair: Where buffel grass is colonising degraded country and basal cover is patchy, the pasture may be in fair or poor condition. Frequent fire and heavy grazing can also cause good pasture condition to decline. In fair condition, desirable grass cover has decreased and intermediate grasses, such as wire grass, white grass, woollybutt grass and annual sorghum, have increased. Undesirable species, such as threeawns, will be present. Shrubs, such as prickle bush, may increase. Figure 2 Buffel grass pasture in fair condition in the Kimberley (photograph taken September 2008). A Buffel grass density is lower and plants are less uniformly spaced. B There are some undesirable rubber bush plants. C Pedestalling of grass tussocks is present; the large bare areas are vulnerable to erosion and there are more less-palatable plants. Poor: In poor condition, a few desirable grass plants with poor vigour will be present. Annual grasses, such as rice grass and annual threeawns, may make up a significant proportion of the stand. Areas of bare ground will be visible and sheet erosion or pedestalling may occur. Undesirable species, such as threeawns, may dominate. Shrubs, such as prickle bush, may increase. 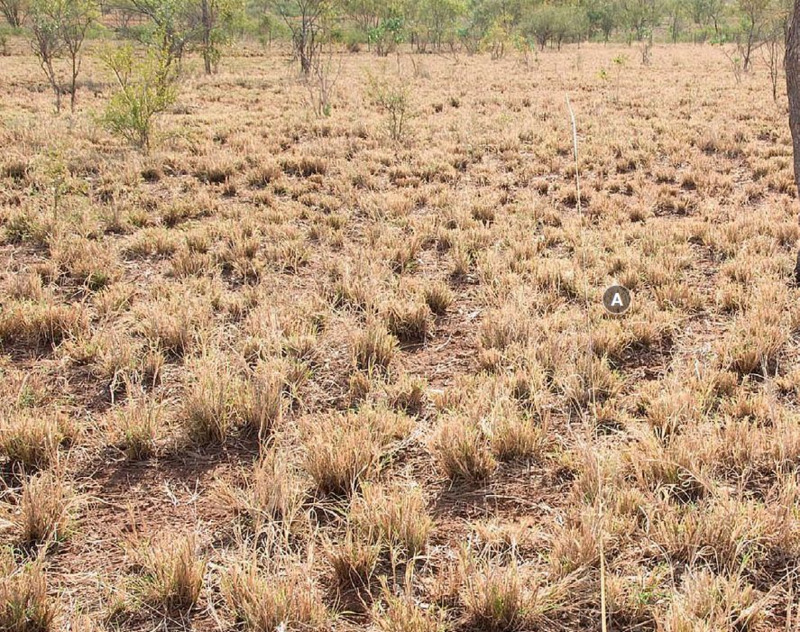 Figure 3 Buffel grass pasture in poor condition in the Kimberley (photograph taken September 2008). A The few remaining buffel grass plants lack vigour or are rank and unpalatable. B Shrubs, such as grevilleas and annual plants, form a relatively large part of the stand. C There is a lot of bare ground and sheet erosion is present.